I love to talk. From the guy behind the deli counter to the woman waiting with me in the TSA line, my best days are spent engaged in conversation. While research has shown that listening is one of the most important skills for business and leadership, data also suggests that we remember only 25 to 50 percent of what we hear. But, I believe when you’re truly having a conversation inspired by curiosity, the doors open to unique, memorable stories. I was reminded how powerful a personal story can be when writing a historical perspective for the Fortune 200 company Parker Hannifin Corporation. Fifty years of stories from over 70 interviewees guided me on the journey that created the hose and fitting technology that is essential for today’s motion and control industry. Bill wasn’t on my list of interviewees and once I found him, I was disappointed to hear he was unable to speak with me due to dementia caused by several strokes. I learned that Bill had helped develop the atom bomb before coming to Parker and was the mastermind behind a key piece of technology that would drive the corporation’s global growth. This made me determined to talk with anyone who knew Bill before his mind declined. A few phone calls and Google searches led me to Bill’s family. Before long, I was sitting in a nursing home where Bill and his wife, Kathleen lived. Kathleen, energetic and beautiful at age 92, along with their three children presented anything and everything that had to do with Bill’s work at Parker Hannifin. 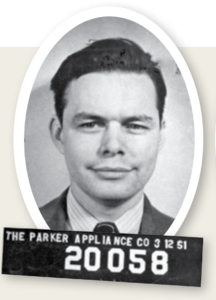 As piles of declassified documents from the atom bomb’s beginnings and original Parker patent drawings surrounded me, I had a conversation with Bill’s family that I would soon never forget. I learned what made Bill tick and how his 42-year career at Parker contributed to the corporation’s global growth. I also learned that Kathleen was just diagnosed with pancreatic cancer. She was eager to know when the book would be published. The elephant in the room announced that she might not be here to read it. “Please honor my husband well, Beth,” said Kathleen. With a hug and promise, I was inspired to present Bill’s story because of the conversations I had that day. While the book was not published before his wife’s death, I made sure she saw the draft just days before her passing. Her daughter said she was pleased. At Kathleen’s funeral, I stood among Bill’s family and friends, honored to be there. Yes, being a good listener can offer significant benefits—but I believe it’s the time given for true conversations that offer so much more. Special note: As this post goes live, I was told Bill Currie passed away at the age of 94. I thank his family for their time and insight into his life—and know his Parker Hannifin family will miss him.